darkside2007's review (This content has been automatically translated from French)" Recorder professional"
4 Track Recorder SD card. Capable of recording at 44.1, 48, 88.2, 96 (4 runs) and 192 kHz (2 tracks only) 16 or 24-bit wave format or Broadcastwave (bwf), no mp3. It can record the micro level (with 48V Phantom) or online combo jack (unlike the ZOOM H4N which records that micro level although the instructions say otherwise). on the other hand-10dBV analog output and digital S / PDIF RCA jacks (no analog output +4 dB XLR or AES). Several combinations of recording tracks are available: four mono tracks, one or two stereo tracks or four tracks encapsulated (ie one single file containing the 4-track-type LCRS 4.0). Focus on only records the tracks simultaneously, no re-re. 4 LR6 batteries are required for operation, but life does not exceed one hour (allow batteries in quantity), but it also depends on the use of microphones, having often used with a stereo mic Studio Projects LSD2 very energy intensive. it also comes with power adapter. Console-output +4 dB line PA (either XLR or by JACK) level. nothing wrong it is transparent. -In capture natural sounds outside. Nothing particular to say, the preamps are pretty good, but if quality microphones (like Neumann KM 180 series) is also used and the ambient sounds are of a certain level (if you're looking to capture the sound of not an ant is likely to have more breath than sound, lol). Note that the R44 has a muliplexeur / demultiplexer M / S for use TV / film, which can be applied either to the recording (conversion M / S stereo to GD) or playback (recording M / S Stereo playback GD). Unfortunately this does not apply to monitoring (can not save M / S stereo and listen GD) damage. 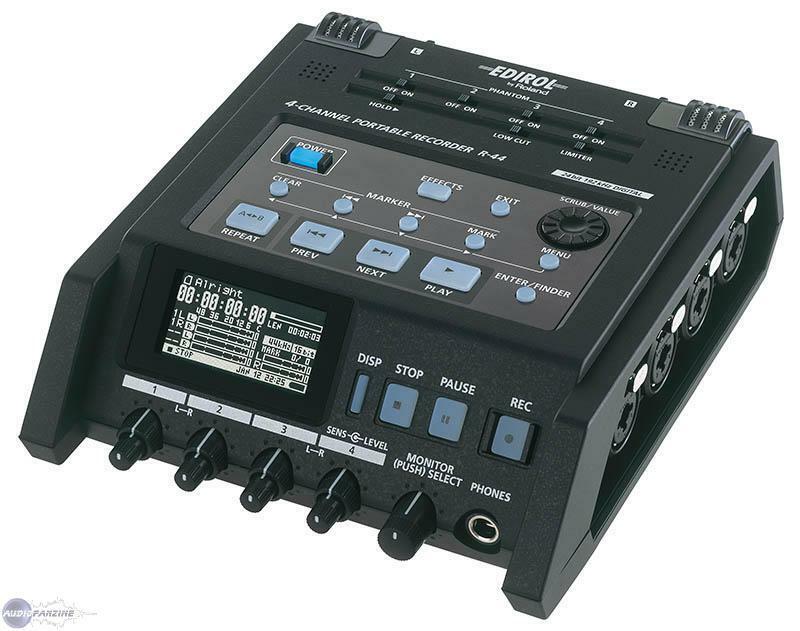 This recorder is designed for pros or amateurs, it requires some technical knowledge, such as file formats, features digital recording or even the types of microphones. (It does not just press REC to make it work). For comparison, the ZOOM H4N that I use is also rather for the fans and musicians, although it can be used professionally. -Consumption of batteries (as often this type of device), about 1 hour with condenser microphones. -The display a bit small, especially peakmetres. -Save A music track 1 or 2. -Listen Track records and recording in sync text on a 3rd or 4th floor. -Can Mix 4 tracks stro in master. As was possible with a multitrack magneto yesteryear. I did this with a TASCAM 244 Jadis. I would buy a portable recorder. I have seen many but am relatively tent by the R-44. I have some compar the Edirol R-44 with among others the Fostex FR2-LE and the Tascam HD-P2. The advantage is that the Edirol possde as prcdemment said among 4 XLR / JACK compared or 2 others who have only two and apparently (see pictures) ergonomics enough convenient for field work. In my case, I want to have a versatile recorder is - say a recorder that allows me to do both made sounds of birds (for example) a catch of live sounds ... In other words, to record As low volume levels that more levs sound levels. And that's what the level that I have a small apprhension regarding the Edirol. Is what will make pramplis their job properly in cases expliqus prcdemment while having a sound quality worthy of the name. I ask myself this question after having compar R-44 to R-4, which has apparently not good pramplis. Are the pramplis they are better than the R-4 (and compar than the Fostex FR2-LE and Tascam HD-P2)? - Integrative DSP that can affect playback or recording or both, and this inland. Each time we find something that ESG, we will find a menu that allows you to configure as you want! - Hair gourment for batteries. Given for 4 hours in recording or reading, I can not. 4 channel portable recorder numrique SDHC card up to 32GB. Trs compact (18.3 x 15.7 x 6.1 cm) and lightweight (1.3 kg with battery and SD card included). Format: WAV and BWF of 44.1 192KHz 16-bit or 24 (limit 2 channel 192KHz). Connectors: 4 inputs with combo XLR-Jack phantom power supply (individually selectable) and 4 RCA outputs, SPDIF In / Out, USB-2, Headphone Output, 2 HP mini Intgr. CONTRL possibility of recording a 2D R-44 via a sync jack. Power: Plugged or 4 LR6/AA (4H maximum autonomy with alkaline APRS to the doc), or external battery (9-12V Voltage paramtrable). Neither taken nor SMTPE Lanc. I put 10 as a single product yet. Using very simple and fast. Manual paper relatively clear and comprehensive (too bad mine is in English!) + Paper guide making his destination beginners (paramtrage positioning of microphones and the R-44). Navigation is fairly intuitive and the menus paramtrage ais plthorique despite the number of possibilities. The instantanment changed are applied and remain in memory. Rglage Gain and the level of individual wheels by (2 per channel), limiter and low-cut. Rglage output level only for monitoring with headphones HP Intgr otherwise fixed level-20dB. Prsence 6 "Effects" numriques, finely paramtrables, recording or during playback: 3-band EQ, 6-band Graphic EQ, Noise Gate, Enhancer, Comp & DeEsser Mixing and MS. Using both a single effect, not mmorisables. (No effect at 192KHz). I put 8 because no slider to adjust the gain / level a couple of microphones in Stereo using a single knob (rglage individual only) and limitations of use of effects. But real pros seem excited about this mini recorder (see link ... all in English: https://taperssection.com/index.php/topic, 103270.0.html ( https://taperssection.com/index.php/topic,103270.0.html ) ). I put 10 because I am There's probably better transport, but I did not need more! I've had one week, so I just used that day trs. I prfre: the wealth of potential as a recorder compact (about the size of an open hand ... for 4 channels! ), Built TB (appearance pro trs solid) and lightweight: To me the recordings in 5.1 thanks the conversion of 4.0 live! What I like least: No carrying case supplied as with the R-4 is mean! And I'll be forced to buy the height of the SNB microphones! Report excellent quality-price product as unique today: A real product a pro rate amateur! I do it again this choice without hsiter! 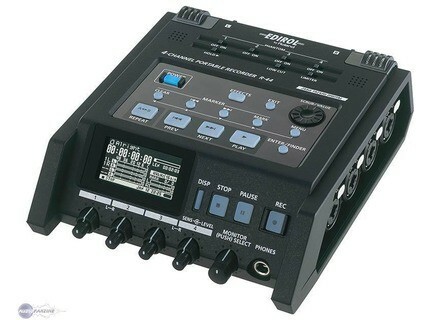 Petit message destination modrateurs: The R-44 is not in the correct CATEGORY product: it should be included in the "Recorders / pocket", such as R-4 (that in fact it replaces) and R-4 Pro, and not in the "Multitrack numriques / DTD". Thus it is certainly not consulted by most of those who compare portable recorders.